Quick News: Contest apps, banned ad and more worms! - Apparently Microsoft made the crazy decision to ban this Xbox 360 ad. It features a large-scale Tarantino-esque so-called "Mexican standoff", but contrary to what you'd expect not a tiny amount of violence! I don't see any harm in this ad, and I've seen worse stuff while playing the Xbox 360 earlier this week. Have you been Mess Duderized yet? Thousands of Messers have already been playing with our free Mess Dudes avatar creator to build their funky virtual alter egos and use them with pride on MSN Messenger or other IM services, on their mobile phones, etc. Heck, some even base their blog layout on them! If you're a Mess.be regular, why don't you make your Dude or Dudette wear a Mess.be-branded t-shirt, or use our orange background theme? >> Create free Mess Dudes/Dudettes! World AIDS Day: Wise up. Wear it. Where's yours? Like every year on December 1st, I try to raise awareness of HIV and AIDS. Already, more than twenty-five million people around the world have died of AIDS-related diseases. In 2005, around 3.1 million men, women and children lost their lives. Nearly twice the number who have died until now - 40.3 million - are now living with HIV, and most of these are likely to die over the next decade or so. The most recent UNAIDS/WHO estimates show that, in 2005 alone, 4.9 million people were newly infected with HIV. It is disappointing that the global numbers of people infected with HIV continue to rise, despite the fact that effective prevention strategies already exist. "Wise up. Wear it. Where's yours?" Use our Red Ribbon Display Picture in MSN Messenger as a sign of support for people living with HIV and a symbol of hope for the future. Just drag & drop the picture next to this post onto your current MSN Messenger Display Picture (More World AIDS Day Display Pics). >> Everybody, make a free donation. It just takes two seconds and clicks. >> Make a money donation. Your generosity is highly appreciated. >> Everything you need to know about AIDS and HIV. >> Test and increase your knowledge of HIV and AIDS with these quizzes. Microsoft is developing a free online service that will let people list items for sale, events and other classifieds-type of information that can be shared either with groups of friends or anyone over the Internet, the company said Tuesday. The service, code-named Fremont, has been in internal testing at Microsoft for about a week and a half, Garry Wiseman, MSN product unit manager, told CNET News.com in an interview. He said he could not say when it would be available publicly. "Basically, it will be a free listing service, with a bunch of twists to make it very unique, such as integration with social networks, in particular integration with MSN Messenger," he said. Fremont will allow people posting a listing to make it searchable globally on the main MSN search site, as well as on a standalone Web site. People will also be able to specify that it be viewable only by their MSN Messenger buddy list members, in their MSN Spaces network, or in a specific domain name e-mail group, such as e-mails that end in "Microsoft.com," Wiseman said. Listings are geo-tagged and integrated with MSN's 3-D satellite image-based mapping application Windows Live Local, formerly called Virtual Earth, so they are viewable on a map, he said. Searchers can specify a geographical area to target as well as ask to see only listings from people in their MSN Messenger buddy list. Even those illegally using the Windows Live Messenger 8.0 BETA will by now have been prompted to automatically upgrade to Windows Live Messenger 8.0.0363. Our visitors from Belgium and The Netherlands can simply apply the existing Dutch translation by PoTaToX again on this build. Not bad for a first skin, this Feel Blue Skin, not bad at all! 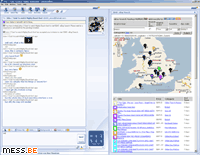 This complete MSN Messenger 7.5 (all versions) makeover is the first (hopefully not last) skin by newcomer Absorbation. Check it out if you're... feeling blue (reminds me of that Silicon Soul track everytime)! >> Download Feel Blue Skin for MSN Messenger 7.5 (all versions). Quick News: WLM File Scanning, MeeNews, Hotmail complaints, AIM Triton, etc. 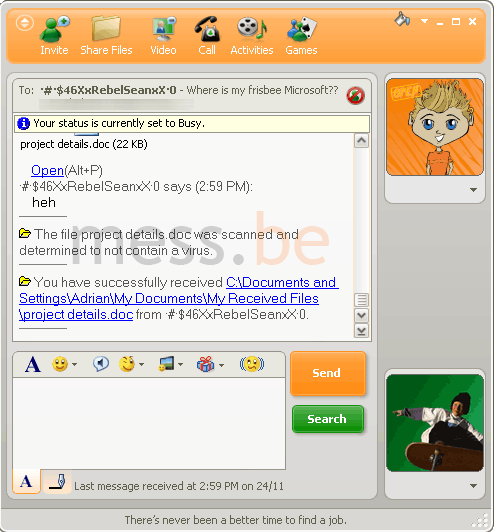 - deAd and XxRebelSeanxX pointed us to the fact that the new build of Windows Live Messenger released earlier this week, has the File Scanning After Files Are Transferred feature now fully activated and working. Here's a screenshot of the option in action. - A couple of weeks ago, MeeGos launched the MeeGifts service: make your friends MeeGo lookalikes and send them their customized Dynamic Display Picture as a gift. And in several blessed regions of the world where Summer is approaching, you can create special Pool Party-themed MeeGos. A final tip: for every MeeGo product you buy before the end of November, you get another one for free (offer available in France, Canada and the U.S.). - MSN Messenger's big competitor in the United States, AIM, returns with a new client built "from scratch". AIM Triton, as it is now called, kills off the old, bloated version and adds tabbed conversations and tabs for video, audio and file transfers, multiple people per IM, multiple accounts in a single program ("internal polygamy", you might say), "unsending" e-mails and a universal address book with Outlook integration. Sounds quite impressive to me, but it's good to know the next Microsoft Messenger generation is just around the corner to strike back! UPDATE: Don't worry if they're all gone by the time you read this... our stash isn't cleared yet! - Images are now only generated once per five minutes (to cut down on excessive server load). - The italic font has changed (although not by default). It's supposed to be a lot clearer, though less similar to the MSN Messenger font. - Bots have been made faster and more efficient.